Many milestones for Ivy Jane this summer after Kindergarten. This week she discovered her first loose tooth, and she promptly pulled it out two days later. 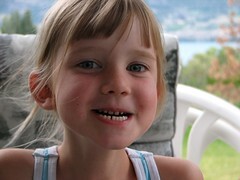 Here's her new gap-toothed smile -- it won't last long though...the one next to it is loose now too. Ivy's also been riding her bike with increasing skill, which makes me beam with pride, of course. Ella's also getting nice long glides with the run-bike, which means she'll probably be ready to start pedaling soon too. So glad I tossed those training wheels.